The Monster Energy NASCAR Cup Series is headed to Talladega Superspeedway for the GEICO 500 and our Sarah Handy breaks down her picks and who you may want to pay attention to this weekend. Brad Keselowski: Keselowski has been crazy good at plate tracks having won three out of the last seven races run. He is my top pick to win come Sunday and here’s why. 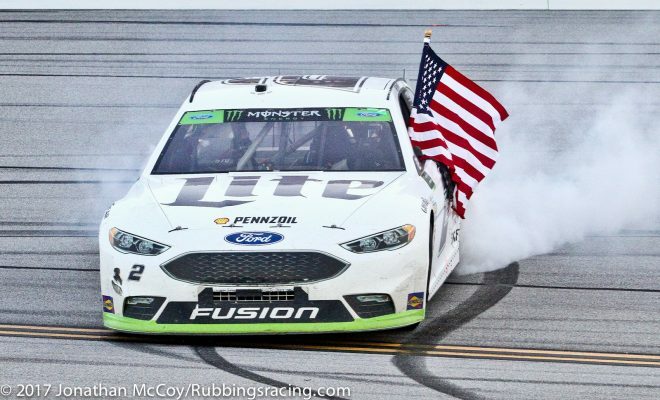 Keselowski may have left Daytona with a disappointing 32nd place finish after being involved in an accident but he along with his Penske teammates have had some of the fastest Fords at plate tracks. Keselowski won the MENCS most recent visit to Talladega last fall and finished 7th in the spring race. He can usually be found up front, leading laps or taking the win from his competitors but most importantly he consistently finishes the plate races which is never guaranteed to happen. David Ragan: There is a very good chance that the Front Row Motorsports driver could surprise the field and win his third career MENCS race on Sunday. It would be his third win on a plate track as well. Back in 2013 Ragan was up front leading this very race and was given the push he needed by then teammate David Gilliland to capture the victory. In both races at Talladega last year Ragan finished in the 10th position so given things go his way on Sunday I plan on seeing him consistently running up front. Matt DiBenedetto: It will be a long shot for DiBenedetto to win on Sunday with all the bad luck the Go Fas Racing driver has succumbed to at both Daytona and Talladega in recent years. Bad luck aside DiBenedetto has run up front consistently before either being involved in accidents or being shuffled back in the field without enough time to make it back to the front. DiBenedetto has finishes of 31st and 18th in his last two starts at Talladega but he showed a lot of promise in February’s Daytona 500 where he was running in the top-5 before being involved in a late race accident. 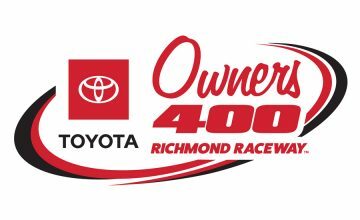 Coming off a 16th place finish in last Saturday’s Toyota Owner’s 400 from Richmond Raceway, both driver and team have plenty of momentum on their side. I would keep an eye on this single car team come Sunday afternoon as everyone knows anything can happen at a plate track. Kyle Busch: Busch has won the last three Monster Energy NASCAR Cup Series races this season. After winning last weekend at Richmond Raceway, Busch and his team have a lot of momentum going into this weekend’s race at Talladega. However, winning four races in a row is a very hard feat and an even harder thing to do at a place like Talladega. I may catch some heat for having him as a dark horse but I personally just don’t see him winning four in a row. In last fall’s race Busch was left with a 27th place result but last spring he finished 3rd so things could fall either way come Sunday. When looking back at February’s Daytona 500, Busch finished 25th so right out of the gate the plate tracks haven’t been too kind to him. Busch hasn’t won at Talladega in the MENCS since April of 2008 and currently has an average finish of 20.80. That aside he does have six top-five’s, seven Top-10s, and 233 laps led at the famed track. It’s clear no one is luckier at this point than the driver of the No. 18 but he will need luck on his side to come out victorious on a track where anything can happen in a matter of seconds. Ricky Stenhouse Jr: Stenhouse Jr won this very race last year for his first win in the Monster Energy NASCAR Cup Series and has shown how consistent he is when the MENCS races at the plate tracks. Stenhouse didn’t have just one but two wins at restrictor plate tracks last year with wins coming at Talladega (May) and Daytona (July). 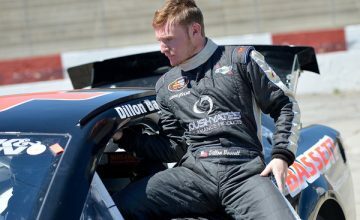 He has led laps in all three of his last starts at Talladega and aside from a 26th place showing in the fall race last October his last finish outside of the top-16 came all the way back in May of 2015. I’m not sure Stenhouse will be able to pull off back-to-back spring time wins but I look for him to have a top-10 finish if he can manage to stay out of trouble. Aric Almirola: Almirola was one lap away from winning the season opening Daytona 500 in February but after tangling with Austin Dillon he was left with an 11th place result. Almirola is very good whenever the MENCS races at either Daytona or Talladega. His first win in the Cup Series came back in July of 2014 at Daytona and since then he has consistently run at both tracks. In Almirola’s last three races at Talladega, he hasn’t finished worse than 8th. Most recently he finished 5th there last October. One thing Almirola has on his side is the fact that he is rarely not running at the end of these races. Finishing a plate race is never a sure thing and after how well he ran in February I would certainly keep an eye on him as a potential winner. Almirola has shown plenty of speed, solid finishes and the fact that since joining Stewart-Hass Racing he has the equipment to run up front each week. Therefore, a win with his new organization is bound to happen, it’s just a matter of when. Who do you think will win on Sunday? Let us know in the comments below. Tune into the GEICO 500 from Talladega Superspeedway which is set for 2:00pm EST on Fox. Great insight lets go Racing and see if Brad can bring it home.